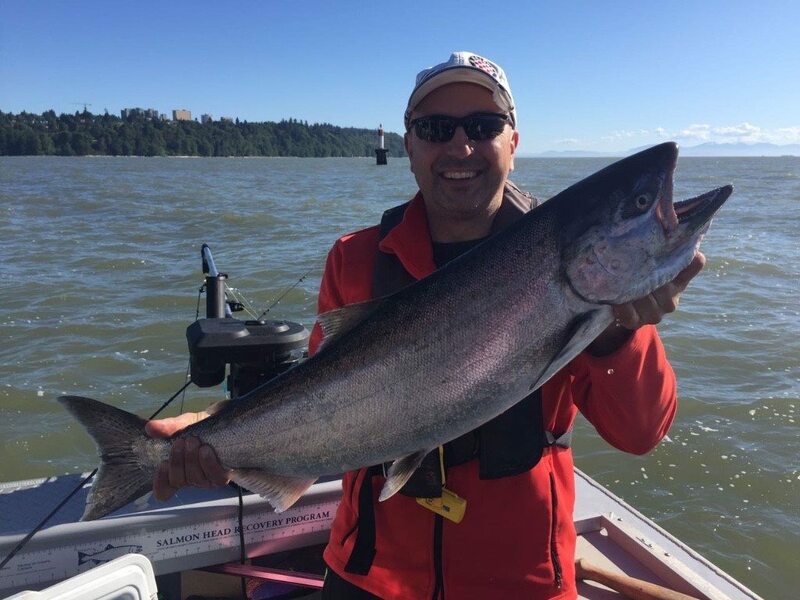 Fishing was pretty good this past week with lots of fish around in our local waters. 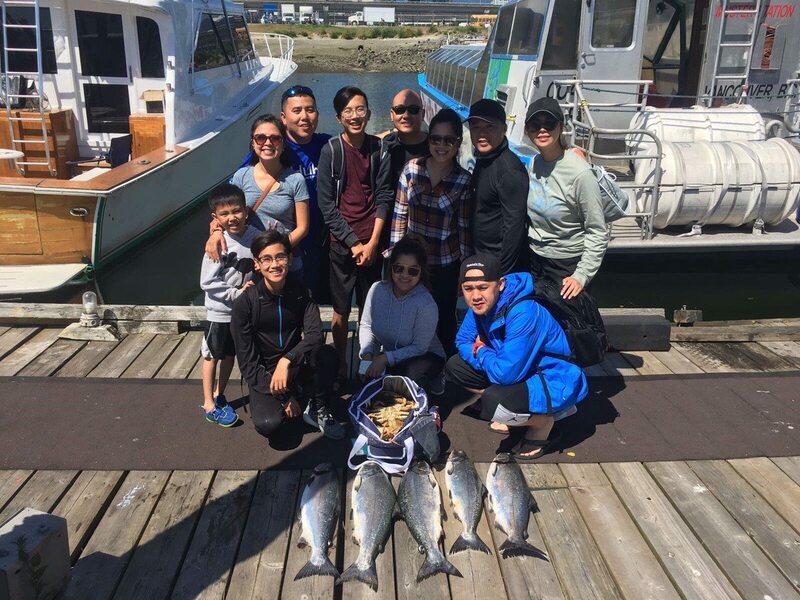 With so many fish on this side of the pond we haven’t been heading over to Nanaimo, Thrasher, or Porlier very much. So this weeks report will focus on what is happening close to home. Let’s start by talking about the water, more specifically the colour of it. The Fraser is in full freshet now, so lots of dirty water has been pumping out of the N Arm and S Arm. This dirty freshwater sits on top of the saltwater and makes things a little darker down there. 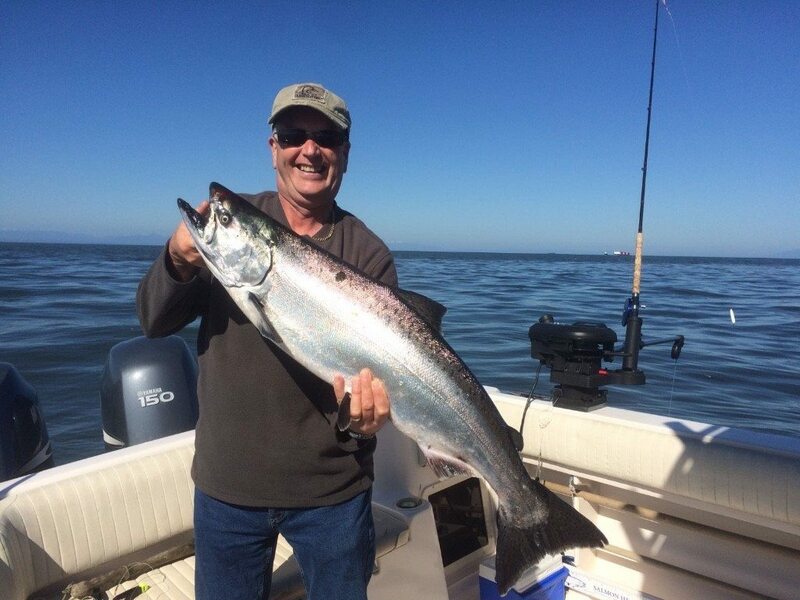 As a result the bait is shallow and so are the chinook. 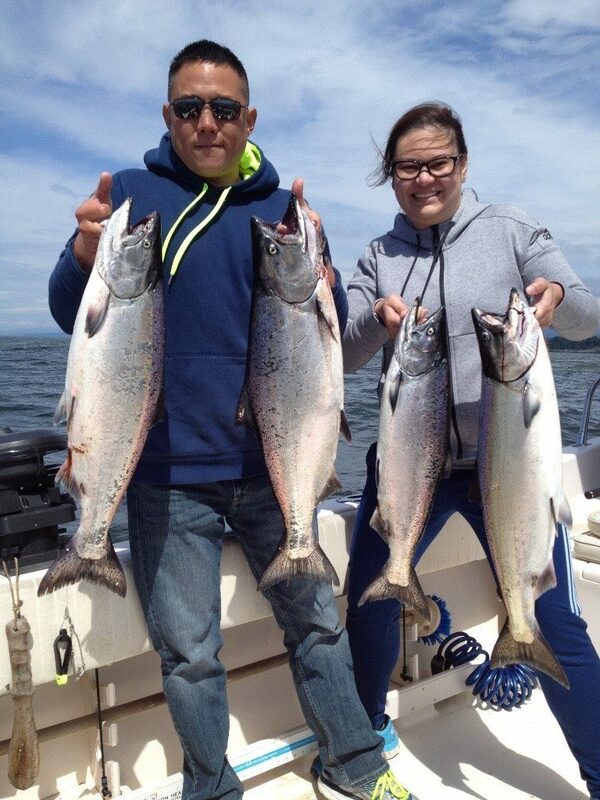 We have been marking chinook on our sounder this past week from 50 to 100 feet and at times have even seen salmon slashing at bait on the surface. As a result productive downrigger depths have been 60 to 120 for the most part. Often a little shallower early in the day and a little deeper as the day progresses. Anchovies and spoons have been the most productive. For anchovies, a 6-foot leader and a glow green or glow green/chartreuse teaser head has been working well. For spoons, 3.5 and 4.0 Kingfisher spoons have been working. Productive colours have been Cookies n Cream, Irish Cream, Homeland Security, Yellow Tail, and Kitchen Sink. Productive flashers have been Salty Dawg, Yellow Green Kinetic with a glow stripe, Lemon Lime, Madi, and Betsy on your shallowest rod. between 50-100 feet out in 450 feet of water off South Bowen. In terms of where to go, it has been interesting to see how drastically it changes each day. The bait and fish are moving around a lot, especially with the big tides we have had recently. This makes it a bit difficult as one morning you are into multiple fish in a location, you go there the next morning on pretty much the same tide, and the fish are gone. Sometimes you are into multiple fish with lots of boats around and other days you are a mile from the pack and doing well. The best thing to do is troll with the current to cover water until you find bait and chinook. Once you get some action, try doing some turns in that general area to stay on top of the fish. Don’t be afraid to put in a waypoint on your chart plotter to use as a reference. This past week there was good to great fishing from Cowan up to Roger Curtis, and then past that area all the way up to Gower. In terms of how far the fish are offshore it has varied from close to the rocks in 250 feet to as far out as 700 feet. As noted earlier each morning is different and you need to cover water to find the hot spot that morning. 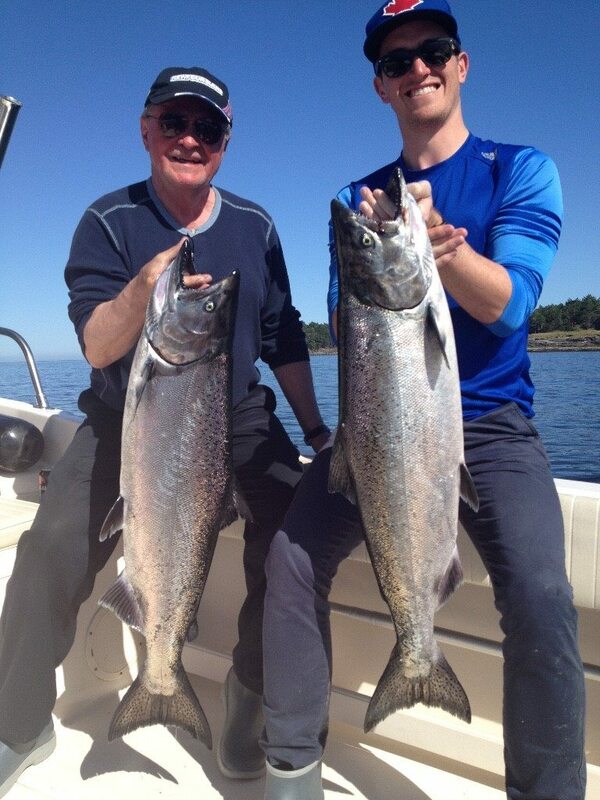 Mastering Local Saltwater Salmon Course Alumnus Vince with a beautiful chinook caught off of Point Grey. You don’t have to go far to catch fish this year. Crabbing has been decent, definitely worth dropping the traps, but it won’t go down as a record year for crabbing.